The first word that comes to mind after seeing this film is “family”. After all is said and done, that’s the main theme of the film, and that’s what truly makes this journey as wonderful as it is. The film begins shortly after the last Guardians adventure. 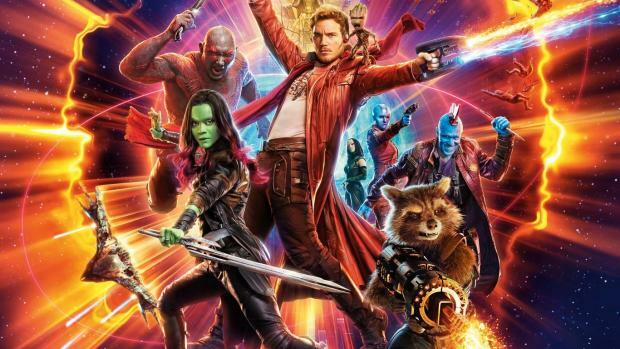 We are quickly reintroduced to the five guardians: Peter Quill (Starlord), Drax, Gamora, Rocket, and of course, the adorable Baby Groot. The story begins in media res with the guardians completing a mission for the Sovereign (a race of near-perfect type beings). Of course after completing the mission, things go awry and the guardians find themselves being chased by the Sovereign (in a brilliant scene complete with sounds from an 90’s arcade). The Guardians find themselves saved by a mysterious figure who turns out to be Quill’s father, Ego. Meanwhile, Yondu is still searching for Quill while trying to restore his honor as a Ravager. And the Guardians find themselves keeping Nebula (Gamora’s half sister) captive. In the interest of not spoiling the film for those who still have not seen it, I will not go into the rest of the plot. Just be assured that things do not go swimmingly for our heroes. Is this film as good as the first? Yes and no. The film has more heart than its predecessor, but probably won’t match up to the first for most simply because the fact that the first was so unexpectedly good. This film by contrast has far more expectations upon it. The performances are quite good, as always. This time around though Drax, Mantis, Yondu and of course Baby Groot stand out. Dave Batista’s portrayal as the socially awkward and incredibly blunt Drax is right on point, and this time around he is given more to work with. Mantis (Pom Klementieff) is an alien with empathetic powers who performance in here scenes with Drax add much to the humor of the film. Yondu, who we were introduced to in the first film, adds some gravity to the film as an outcast looking for redemption. Of course Baby Groot steals the show a bit, partially because he is so damn adorable, but also because his condition changes the dynamic of the Guardians. At the end of the first film, he was the one who protected the Guardians, but here they have to care for him. All in all, the film is exciting, fun, and unexpectedly touching at times. It was not until after I saw this film that I thought to myself “These might be the most fun characters in the Marvel universe”. Case in point, the villain of the film is not shown or hinted at in any of the trailers. When was the last time a hero movie left out any hint of the villain or main conflict of a film in the trailer and people still flocked to see it? I cannot remember a time. Perhaps it’s the fact that these characters are so loveable and engaging that people just want to see them on the screen, regardless of what mischief they are getting into. And that is a powerful statement to make. As an addendum: you may want to stay through the entire credits as there are five (yes five) post credit scenes. This entry was posted in Comics, Movies, Reviews. Bookmark the permalink.